Rodex Forte is a dietary supplement that helps mood swings to maintian good health and nutritional Support for your circulatory system! Our Rodex Forte is the only sustained release beaded capsule. This continuous release guarantees better utilization of vitamins B6, B12 and folic acid. 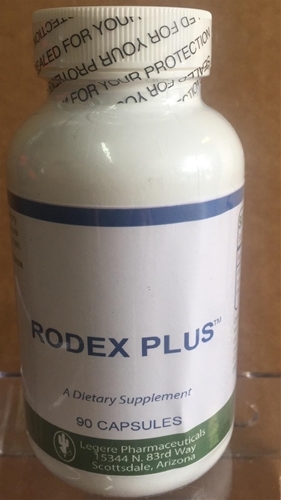 Rodex Forte is a pharmaceutical grade dietary supplement has been specially formulated for a variety of conditions. In order to achieve the maximum results with Rodex Forte this clinical dosage of these B vitamins is recommended. Many doctors requested this improved formula of Rodex Forte to satisfy their patient's needs. Vitamin B6 - needed for the conversion of homocysteine to the harmless chemical, cystathionine, thus preventing the homocysteine-induced oxidation of cholesterol. Vitamin B12 - Known as the longevity vitamin, possibly because it helps the enrgy level and activity of the nervous system of the elderly. B12 is essential for normal multiplication of cells (especially red blood cells), needed for a healthy nervous system, proper metabolism, and stress fighter. Folic Acid - This important vitamin aids in boosting energy production and red blood cell formation and is an essential component for healthy cell division and replication. Folic Acid is essential for the proper betabolism of homocysteine. Benefits of Taking Rodex Forte = Nutritional Support to help your body against homocysteine ! What Is Homocysteine? Homocysteine is an amino acid in the blood. Epidemiological studies have shown that too much homocysteine in the blood (plasma) is related to a higher risk of coronary heart disease, stroke and peripheral vascular disease. Other evidence suggests that homocysteine may have an effect on atherosclerosis by damaging the inner lining of arteries and promoting blood clots. However, a direct causal link hasn’t been established. Plasma homocysteine levels are strongly influenced by diet, as well as by genetic factors. The dietary components with the greatest effects are folic acid and vitamins B6 and B12. The Folic acid and other B vitamins included in Rodex Forte, help break down homocysteine in the body. Several studies have found that higher blood levels of B vitamins are related, at least partly, to lower concentrations of homocysteine. Other recent evidence shows that low blood levels of folic acid are linked with a higher risk of fatal coronary heart disease and stroke. Several clinical trials are under way to test whether lowering homocysteine will reduce CHD risk. Recent data show that the institution of folate fortification of foods has reduced the average level of homocysteine in the U.S. population. Recent findings suggest that laboratory testing for plasma homocysteine levels can improve the assessment of risk. It may be particularly useful in patients with a personal or family history of cardiovascular disease, but in whom the well-established risk factors (smoking, high blood cholesterol, high blood pressure) do not exist. Patients at high risk should be strongly advised to be sure to get enough folic acid and vitamins B6 and B12 in their diet. Foods high in folic acid include green, leafy vegetables and grain products fortified with folic acid. Vitamin B12 may help in supporting a healthy nervous system, proper metabolism, and stress fighting. May help increase energy. Dietary supplement for irritability, concentration, memory and balance.This vitamin is necessary for energy production in every cell in your body, and vital for your health. If you are not getting enough — and millions of people aren't — it can cause heart disease, stroke, vascular disease, Alzheimer's, aneurysm, kidney disease, erectile dysfunction, and many other ailments. Directions for taking Rodex Forte: Take one to two Rodex Forte capsules daily.